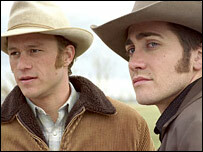 Brokeback Mountain is about two men who meet and fall in love while wrangling sheep in Wyoming in the 1960s. "It was not the subject matter," said Diane Wiffin, of the Massachusetts Department of Correction. "It was the graphic nature of sexually explicit scenes." She said the decision was not related to the critically-acclaimed film's plot involving a gay love affair. Ms Wiffin would not discuss what discipline the officer would face. The film was shown to inmates in the state's largest prison in Norfolk, about 40km (25 miles) south-west of Boston. Directed by Ang Lee, Brokeback Mountain was feted by film critics and secured three Oscars last month, although it lost out on best film to racial drama Crash.